Raymond Franklin Page, known as Frank Page (July 16, 1925 – January 9, 2013), was a boadcaster from radio station KWKH in Shreveport, Louisiana, who on October 16, 1954 introduced Elvis Presley to the Louisiana Hayride Country music program. The Hayride was presented weekly from 1948 until 1960 at the Shreveport Municipal Auditorium; it was akin to Shreveport's temporary alternative to the permanent Grand Ole Opry of Nashville, Tennessee. Page was born in Malvern in Hot Spring County, Arkansas, a son of Raymond Foster Page and the former Stella Irene Coston. He attended school in Harlingen, Texas, Malvern, and North Little Rock, Arkansas. He enrolled in high school in the capital city of Little Rock, where he worked beginning at the age of sixteen for KGHI radio and thereafter at KLRA. On December 7, 1941, Page was broadcasting at the time of the Attack on Pearl Harbor. In 1943, he enlisted in the United States Army during World War II. He was assigned briefly at the end of the war to Armed Forces Radio in Berlin, Germany. In 1945, while being transported home on a Greek vessel, Page was shipwrecked in the North Atlantic. In 1946, he returned to KLRA but he and his announcing partner, Bob Fulton, were soon fired. His next and permanent stint brought him to Shreveport on Thanksgiving Day 1947. Page joined the staff of KWKH, named for broadcast pioneer W. K. Henderson, and worked at the station for sixty-five years until his retirement in 2005 at the age of eighty. In 1949, he began announcing the Louisiana Hayride. In addition to Presley, Page influenced the careers of Nat Stuckey and Jim Reeves, both of whom were also radio announcers at KWKH, and Bob Dylan, who listened to KWKH from his home in Hibbing, Minnesota, and gained ideas for his future musical compositions. In the broadcasting business, Page was known for courtesy, humility, and willingness to mentor others seeking to enter the entertainment field. CBS Sports announcer Tim Brando, who was reared in Shreveport, recalls having known Page as a longtime friend of his family. Page influenced the early names in Country music: Johnny Cash, Johnny Horton, George Jones, Loretta Lynn, and Hank Williams, Sr. Presley performed "That's Alright Mama" on the radio version of Louisiana Hayride in 1954; a year later, Presley debuted nationally on the television version of the Louisiana Hayride. When they first came to Shreveport, Frank and his wife and childhood sweetheart, Helen, rented an apartment across the street from singer and Governor Jimmie Davis, then in his first term in office in Baton Rouge. The Pages' landlady was Mrs. F. A. Bewley, wife of the owner of a large furniture store in Shreveport. Page and Davis became lifelong friends. A member of the County Music DJ Hall of Fame, Page was a recipient of the Lifetime Achievement Award of the Louisiana Association of Broadcasters. In 2009, he was inducted into the Wall of Fame in Shreveport. Page worked closely with KWKH personality Louise Alley, who in 1978 established her own advertising agency which she operated until 2012 in her adopted city of Shreveport. In 2011, Page was named one of "Five Living Legends of Shreveport" by Danny Fox (1954-2014) of KWKH radio. Others named were Bob Griffin of KSLA and KTBS-TV, James Burton, Hank Williams, Jr., and Claude King, who like Page died in 2013. Page died in a Shreveport hospital of a severe respiratory infection. He was survived by his wife of sixty-eight years, the former Helen Hulett, whom he married in 1944 in Brownwood, Texas, while he was on a three-day pass from the Army. The couple had a daughter, Patti Lea Stephens and husband Ronald W. Stephens and grandson Christopher P. Stephens, all of Littleton, Colorado. Page was survived too by his brother, Larry Page and his wife, Mary Ann, of Shreveport. Page is interred at Forest Park East Cemetery in Shreveport. 1 2 3 4 "Raymond Franklin "Frank" Page". findagrave.com. Retrieved August 29, 2013. 1 2 3 "Louisiana Hayride voice Frank Page dies at age 87, January 12, 2013". New Orleans Times-Picayune. Retrieved August 29, 2013. ↑ "Chris E. Hayner, Frank Page dies: Elvis Presley announcer was 87, January 11, 2013". blog.zap2it.com. Retrieved August 29, 2013. 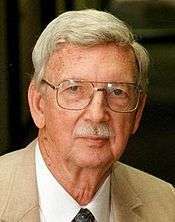 ↑ "Willard Woods, Funeral set for Hayride voice, broadcasting legend Frank Page, January 9, 2013". KSLA-TV. Retrieved August 29, 2013. ↑ "Louise Frances Koury Alley". The Shreveport Times. Retrieved October 11, 2015.